Water-resistant smartphones have become very popular, and for good reasons. Although it’s not a necessity, people still view being water resistant as something that’s required for their smartphone. Waterproof smartphones were a gimmick at first. Its main purpose was to save itself from splashes and drops into the water. Now, people use it to take pictures and videos underwater. But there are other criteria like good battery and great battery life. FUN FACT: 90 % of all Japanese cell phones are waterproof. This is so that they can use their smartphones in the shower. Now that you know that little piece of trivia, let’s roundup the best waterproof Android smartphones! Featured in our best camera and best battery life smartphone list, the Samsung Galaxy S6 Active is the smartphone to have. The Samsung Galaxy S6 Active is a more ruggedized and resilient version of the original Samsung Galaxy S6. The Samsung Galaxy S6 Active is powered by an Exynos 7420 CPU, a Mali-T760 GPU, and has a 5.1-inch Super AMOLED display. The camera has an autofocusing 16-megapixels image sensor with a flash. Yes, you read that correctly. The Samsung Galaxy S6 Active has the same specifications as the regular Samsung Galaxy S6. So, what’s so great about it? The user interface is clean but is feature-packed on the inside. The camera UI has manual controls (if you need any) and you can save your own custom presets, too. It snaps the photos quite fast, as well. But, the big feature of this smartphone is that it’s IP68 water resistant, which means, yes, you’ll be able to snap pictures and capture video underwater. The settings are quite difficult to maneuver underwater, but, you can still use the volume buttons to capture pictures. Sony’s latest flagship is nothing short of what you expected to see. The premium glass-metal look, the great specs, and it is the first smartphone to pull off a 4K display. Sure, it’s going to hurt your wallet, but, it’s up to you whether you need everything it offers or not. The Sony Xperia Z5 has killer specs. It packs in a 5.2-inch IPS LCD, which can show up to 16 million colors at a time. It has high-end internals like the Snapdragon 810 for the CPU, and the Adreno 430 as the GPU. Sony has always owned bragging rights against its competitors in the camera sector, so, can it pull off a one up again? It has an insane 23-megapixel front sensor, coupled along with phase detection autofocus and LED flash. The secondary camera, on the other hand, is a 5.1-megapixel shooter. Following the Xperia series tradition, the Sony Xperia Z5 is water-resistant, but, not waterproof. If you were expecting to take underwater selfies, then, I suppose that’s not a good idea. 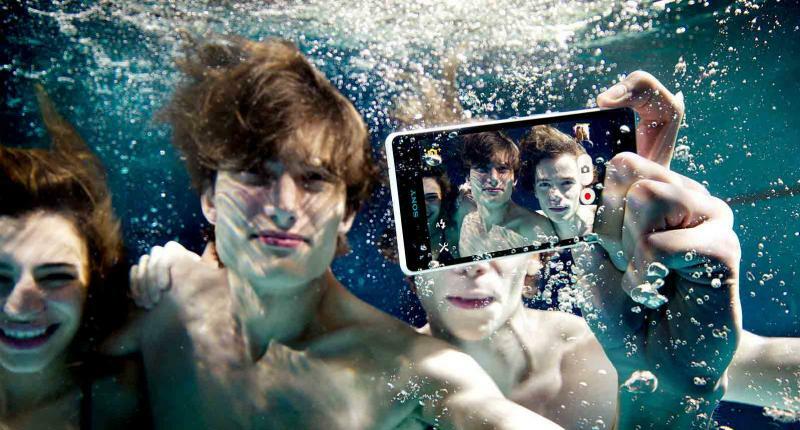 Sony, in a recent keynote, suggested the phone should not be used underwater. Bummer. Sure, the Samsung Galaxy S5 might not be the newest Galaxy around, but, it’s still damn-near perfect. Hardware first. The Samsung Galaxy S5 is powered by Qualcomm’s Snapdragon 801 processor, coupled with 2 gigabytes of RAM. It’s powered by an Adreno 330 GPU. Sure, these are not the highest specs, but, other things that make this smartphone pop. It has a 5.1-inch Super AMOLED display, and a 2,800 mAh battery. Again, the display is crisp, but the AMOLED variant helps in this regard. The Snapdragon chipset is quite helpful when it comes to conserving battery life. A great feature integrated into its OS is the ultra power-saving mode, that gives you battery for days at a time. The Samsung Galaxy S5 wouldn’t have made it into this list if it weren’t for the fact that it is IP67 water and dust resistant. This makes Samsung’s flagship a bit more durable. Underwater pictures, here I come! Long story short, the Samsung Galaxy S5 Active is a more ruggedized version of its sibling, the regular Galaxy S5. Let’s get to the specs, shall we? The front panel measures 5.1-inches, and it is a super AMOLED 1080p display. The beautiful display is protected by Corning’s Gorilla Glass 3. The Samsung Galaxy S5 Active is powered by last year’s Snapdragon 801 processor, and an Adreno 330 for graphical processing. This is coupled with 2 gigs of RAM, makes an efficient device. Now, for the camera. It has a 16-megapixel rear shooter, coupled with a 2-megapixel front camera. Finally, the Galaxy S5 Active is IP67 dust and water resistant too. Probably the last smartphone anyone (including myself) will think to be water resistant; The HTC Desire Eye was HTC’s entry into the mid-range smartphone category last year. It was featured in our best smartphone camera list. What does the HTC smartphone have to offer? The HTC Desire Eye has a 5.2-inch regular touchscreen. It’s powered by a Snapdragon 801 CPU, coupled with an Adreno 330 GPU. It’s pretty speedy with its 2 gigs of RAM. Moving onto the camera, it has a sensor size of 13-megapixels, coupled with dual LED flash and autofocus. More amazing is the 13-megapixel shooter on the front coupled with the same autofocus and dual LED flash. That’s a huge deal. As you’d guess because it’s on this list, it’s IPX7 water and dust resistant. What are you waiting for? Get to the swimming pool and take some selfies! Although personally, I wouldn’t want a smartphone solely for the fact that it’s water and dust resistant, it’s surely a good addition to have. The above smartphones are perfect for people who is active outdoors, or their daily lives include a bit of rough handling. If you think we left out any other great water resistant smartphones, don’t forget to let us know in the comment section below. The future inventor of a laser-induced workstation (whatever that means), Rashid is a gamer, tech geek and adventurer. Does anyone know who stole a jar of Nutella from Bear Grylls? Rashid claims he does.